A Fine Spring Weekend. The showers are staying north of St. Cloud, and although we can't rule out a stray PM shower or even a T-shower, most of today will be dry, with enough sun for upper 60s to near 70. A few heavier thunderstorms are possible from Sunday night into Wednesday of next week, even a slight chance of a few isolated severe T-storms. A chilly wind whips up on the backside of next week's slow-motion storm, keeping us unseasonably cool for the Walleye Fishing Opener one week from today. You'll need a sturdy jacket if you're heading out to your favorite lake. Nothing new there. More Sun Than Showers. 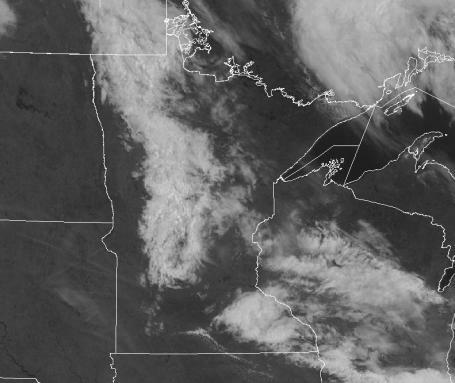 The high-res GOES visible satellite image, taken around noon, shows a persistent band of showers from near Willmar north to Long Prairie and Brainerd - drifting to the east/northeast. Translation: we should enjoy a very pleasant, party to mostly sunny afternoon with highs near 70 - most of the showers passing well north of MSP. Doppler: 11 am. 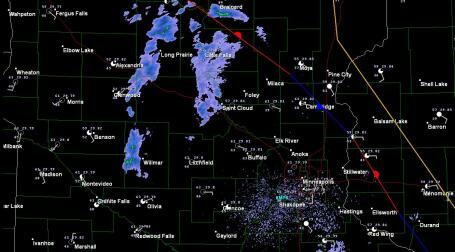 The sun should be out most of today, but we're still tracking a few (light) showers on Doppler from near Willmar to St. 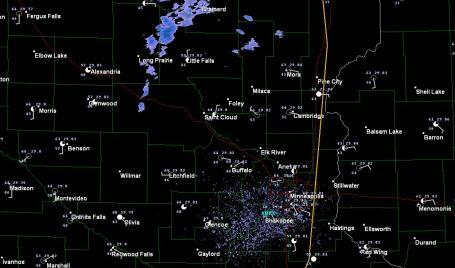 Cloud and Long Prairie - the brunt of the showers should pass north/west of MSP, but the chance of bumping into an instability thundershower will increase as the afternoon goes on - nothing severe expected. Doppler radar image at 11 am Saturday. Doppler: 12:30 pm. The area of showers near Long Prairie and Brainerd is shrinking, staying north/west of St. Cloud. May 6, 1965. Tornado Terror in Minnesota. After the extraordinary Friday we just enjoyed (spring the way it was meant to be) it's hard to imagine the sense of fear and dread that gripped much of Minnesota on May 6, 1965. As many as 4 EF-4 tornadoes swept from Waconia and Young America into the Lake Minnetonka area, hitting the Fridley/Moundsview area very hard. Fridley was hit by TWO EF-4 tornadoes, estimated wind speeds from 150-180 mph. 13 Minnesotans died, over 370 were injured. Photo credit: "An areal view of the destruction along Louisa Drive in Mounds View. Picture courtesy of the Minnesota Historical Society, Photograph Collection." Dispelling A Dangerous Weather-Myth. Tornadoes CAN Hit Metropolitan Areas. I'm still amazed (and a little horrified) by the number of otherwise smart, savvy Minnesotans who say, "I don't have to worry about tornadoes, since I live in city, or a suburbs, or next to a lake or river (or hill)." I hear this all the time, and I wind up explaining that tornadoes can touch down anywhere. A little asphalt or concrete (or water nearby) won't make any difference, neither will a few high-rise buildings. It's simply a matter of statistics and probabilities. As suburbs expand the risk of injury and damage will continue to grow - what was farmland 30 years ago is now subdivisions with homes - the potential for catastrophic damage and loss of life has spiked as more land has been developed in recent years. 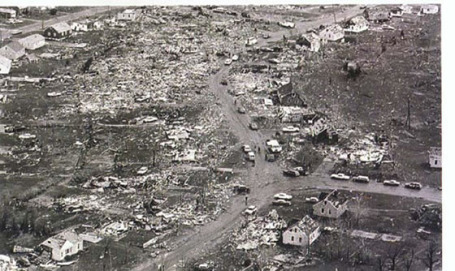 The National Weather Service has a very good summary of the May 6, 1965 outbreak here: "The worst tornadoes in Twin Cities history occurred in 1965, with five tornadoes sweeping across the western and northern portions of the 7-county region, and a sixth tornado just outside the metropolitan area. Four tornadoes were rated F4, one was an F3, and the other produced F2 damage. Thirteen people were killed and 683 injured. Many more would have been killed had it not been for the warnings of the U.S. Weather Bureau, local officials, and the outstanding communications by local radio and television stations. Many credit the announcers of WCCO-AM with saving countless lives. It was also the first time in Twin Cities history that civil defense sirens were used for severe weather. 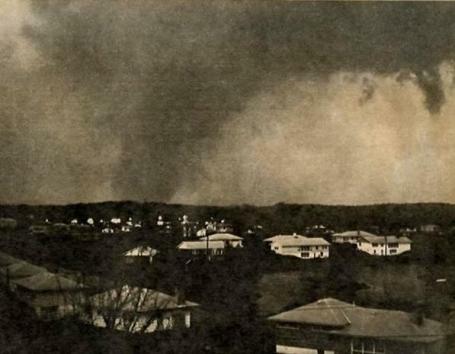 There were two photographs of tornadoes - the Deephaven tornado and the second Fridley tornado were both published in the Minneapolis Tribune. It is unknown whether anybody else took pictures of any of the tornadoes that day. Recently discovered radar archives of this tornado outbreak are available at the bottom of this page. EF-4 Over Minnetonka. "A photo taken by Minnetonka resident H. B. Milligan of a tornado crossing to the west of the junction of Hwy 7 and 101 on May 6, 1965. It is believed that this was the tornado that touched down in Chanhassen at 6:27 p.m. and dissipated in Deephaven at 6:43 pm. The photo was published in July 1965 by the Minneapolis Tribune as part of the "Photos of the Week" feature, and photographers received a $5 award. U.S Weather Bureau Principal Assistant Joseph H Strub, Jr. (who would later become Meteorologist-in-Charge) assembled 36 slide photographs of damage from the May 6, 1965 tornadoes. Some time ago, these were discovered in a box of photos at the National Weather Service, and we are pleased to present them here (although two of them are too blurry to be included). Notes written by Mr. Strub accompanied the photos. The 36 slides and notes did not cover all six tornadoes. In the weeks following the tornadoes, the slides were numbered according to the tornado that was believed to have inflicted the damage. Specifically, Mr. Strub labeled the first tornado as starting at 6:27 p.m., moving from Chanhassen to Deephaven to North Minneapolis and Fridley, and he numbered these pictures 101 through 109. He indicated tornado #2 as starting near Green Isle at 6:50 p.m., ending near Hamel, and he numbered them in the 200s. He listed the fifth tornado as starting at 8:10 p.m., stated it was the second tornado to hit Fridley, and labeled them in the 500s. 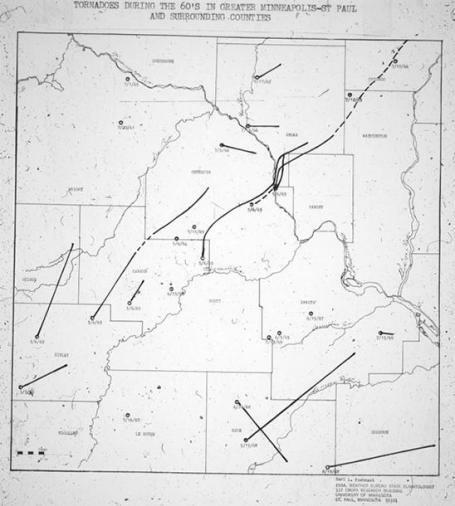 The written summary contained in the May 1965 edition of Storm Data described these specific tracks and times, and also mentions three tornadoes as having hit Fridley. Tornado Tracks. "State Climatologist Earl Kuehnast, probably in 1970, produced a map showing tornado tracks in the 1960s, including three tornadoes moving across Fridley on May 6." Warm Water Causing Colder Winters? I know, this is the meteorological equivalent of saying "up is down, left is right." But before you dismiss it outright, try to follow Accu Weather's explanation of how warm Gulf Stream waters may have influenced the position of the prevailing jet stream winds for much of the past winter and spring: "Researchers at the California Institute of Technology have found an explanation. The culprit is warmer water off the eastern coasts of these continents. "These warm ocean waters off the eastern coast actually make it cold in winter-it's counterintuitive," said Tapio Schneider, the Frank J. Gilloon Professor of Environmental Science and Engineering. By using computer simulations of the atmosphere, the researchers found the warm water off an eastern coast will heat the air above it. That leads to the formation of atmospheric waves, which then draw cold air from the northern polar region. 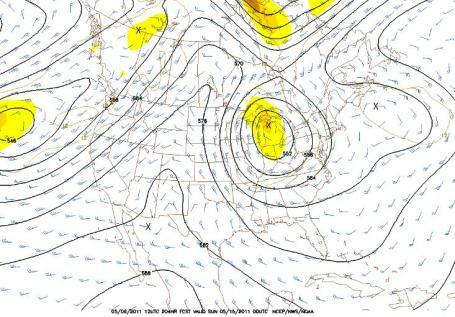 That cold air will then form up just west of the warm water. In that same situation with the Atlantic Ocean, the cold air ends up right over the northeastern U.S. and eastern Canada. The explanation used to be that the Gulf Stream delivered warm water from the Gulf of Mexico to northern Europe. In 2002, research showed the currents are not able to deliver that much heat. In actuality, they contribute only about 10 percent of the warming." Connecting The Dots. Image credit: "This image, taken by NASA's Terra satellite in March 2003, shows a much colder North America than Europe‑‑even at equal latitudes. White represents areas with more than 50 percent snowcover. 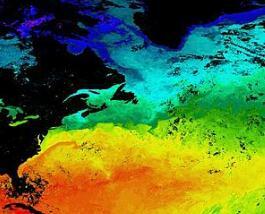 NASA's Aqua satellite also measured sea-ice temperatures. 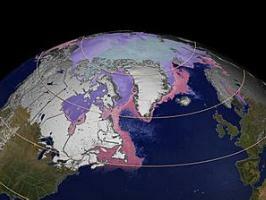 Water between 0 and ‑15 degrees Celsius is in pink, while sea-ice between ‑15 and ‑28 degrees Celsius is in purple." Information courtesy of Accu Weather. A Slow-Motion Natural Disaster. Unlike last week's record tornado outbreak, which reduced homes to rubble in a matter of seconds, flooding on the Mississippi is a long-duration disaster, with the river above flood stage for the better part of 2 weeks, testing the strength and resiliency of levees. NOAA has a good overview of flooding on the lower reaches of the Mississippi River here. 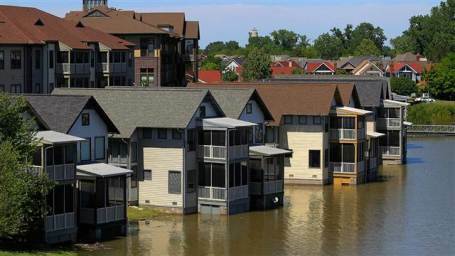 Memphis Is Urged To Evacuate As Mississippi River Swells. The Los Angeles Times has the latest on a very serious situation unfolding for the Memphis area: "The Coast Guard closed a stretch of the swollen Mississippi River to barge traffic Friday while police farther south in Memphis went door to door, warning thousands of people to leave before they get swamped. Emergency workers in Memphis handed out bright yellow fliers in English and Spanish that read, "Evacuate!!! Your property is in danger right now." 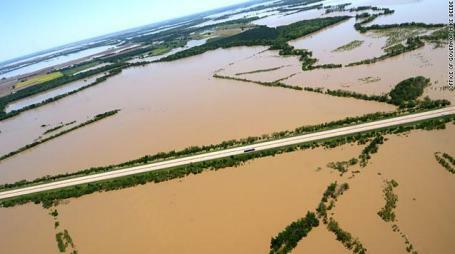 All the way south into the Mississippi Delta, people faced the question of whether to stay or go as high water rolled down the Big Muddy and backed up along its tributaries, breaking flood records that have stood since the Great Depression. Because of levees and other flood defenses built over the years, engineers said it was unlikely any major metropolitan areas would be inundated as the water pushed downstream over the next week or two. But farms, small towns and even some urban areas could see extensive flooding. "It's going to be nasty," said Bob Bea, a civil engineer at UC Berkeley who investigated levee failures in New Orleans after Hurricane Katrina in 2005. How bad it gets depends on how well the flood protection systems have been built and maintained, he said." A Very Close Call For Memphis. The all-time record for the levees protecting Memphis is 48.7 feet. The predicted flood stage is 48 feet by next Tuesday/Wednesday. The very latest NOAA prediction for Memphis is here. Mississippi Floods Force Evacuations Near Memphis. The latest from Reuters: "The rising Mississippi river lapped over downtown Memphis streets on Thursday as a massive wall of water threatened to unleash near record flooding all the way to the Gulf of Mexico. Water lapped over Riverside Drive and onto Beale Street in Memphis, and threatened some homes on Mud Island, a community of about 5,000 residents with a river theme park. The island connects to downtown Memphis by a bridge and causeway. Emergency officials in Millington near Memphis were "going door-to-door, asking people to leave," according to the Tennessee Emergency Management Agency. Large amounts of rain and melt from the winter snow has caused a chain reaction of flooding from Canada and the Dakotas through Illinois, Indiana, Missouri, Kentucky, Arkansas and Tennessee. 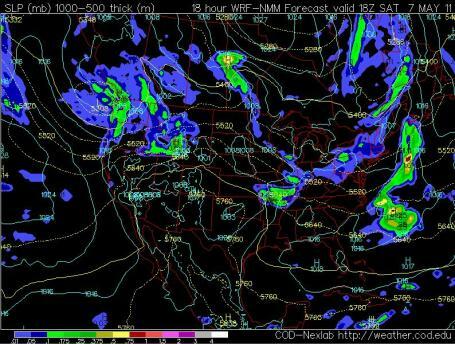 It is expected to soon hit Mississippi and Louisiana at the mouth of the Mississippi River. 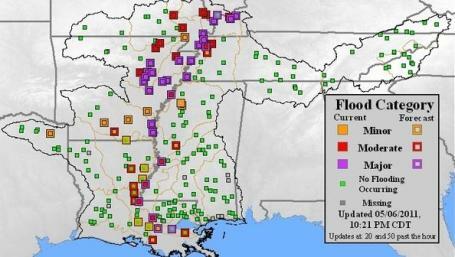 "The flood is rolling down, it is breaking records as it moves down and it is one of those wait-and-see type of things as to how massive it is going to be when it's all said and done," said Charles Camillo, historian for the Mississippi River Commission and the Mississippi River and Tributaries Project." President Declares Emergency For Louisiana. 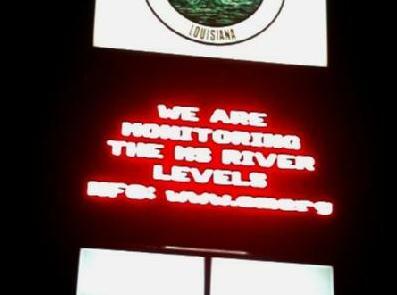 WDSU-TV in New Orleans has the latest: "WASHINGTON -- The federal government has declared a state of emergency for Louisiana in the early stages of what could be a devastating flood.The Federal Emergency Management Agency said aid has been made available to supplement state and local response efforts in the area struck by flooding that began late last month. The situation is expected to get significantly worse in the weeks ahead.The move, authorized by President Barack Obama, authorizes FEMA to coordinate disaster relief efforts and to provide appropriate assistance for required emergency measures." States Unsure Of Tornado Tolls. The National Weather Service had warnings out on approximately 90% of last week's tornadoes, with an average lead time of 24 minutes, twice the national average of 12 minute lead time. And yet hundreds died, many of the victims in mobile homes and other structures without basements, sitting ducks when an EF3+ strength tornado arrives. Scores of people in Alabama and Mississippi are still missing, well over a week after America's single largest tornado outbreak. USA Today has the story: "TUSCALOOSA, Ala. (AP) — Where is Johnnie Brown's sister? Or the friend Billie Sue Hall talked to every day? A week after tornadoes ripped neighborhoods to shreds across the South, there are no answers. It's unclear how many people are missing across the seven states where 329 deaths have been reported. There are 25 unaccounted for in Tuscaloosa alone, Mayor Walter Maddox says, but that number could be off because of the chaos the storm left behind. Cadaver-dog teams across the region are scouring the debris to uncover whatever tragedies may remain, and even bad news would be comforting to anguished families. Tracy Sargent's dog team took minutes to do what humans searching for hours could not: Locate the body of a University of Alabama student in a maze of twisted trees and debris. The young man's father was there when the body was found here this week. The father "went over there and bent over and touched his son and started talking to him," Sargent said. "And he hugged him, started crying and told him that he loved him and that he would miss him." 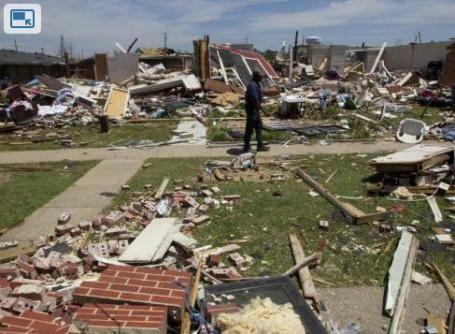 Alabama Tornadoes: Dozens Remain Missing One Week Later. Another perspective from the Christian Science Monitor: "Dogs and search crews are still combing rubble mountains and far-flung pastures in search of Alabama tornado victims, dozens of whom still can't be located a week after disaster struck. At least 328 people across six states perished in the record tornado outbreak that saw at least 178 major confirmed tornadoes slash across wide swaths of the Deep South, striking major population centers and rural hamlets alike. The rolls of the missing are uncertain and ever changing. The actual number of missing across the South is hard to come by, with the firmest data released by Tuscaloosa, Ala., which alone reports 25 missing. 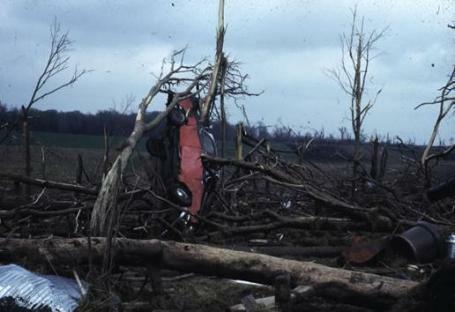 The task of disaster investigators is complicated not only by the exhaustive job of rubble-searching, but also by people's loss of cell phones; the destructiveness of the tornadoes, which in some cases carried debris miles; and the uncertainty, even in tight-knit communities, over whether someone is missing or simply left in a hurry without telling anyone. The inability to account for everyone, meanwhile, is preventing many families and communities from moving toward a sense of normalcy, similar to what happened in places affected by hurricane Katrina and the 9/11 terror attacks." Alabama Tornado Casualties: A List Of Those Who Died In The April 27 Storms. It's one thing to recite (grisly) statistics, it's quite another when you see the long list of names, over 300, who were killed by last week's storms. Al.com has the story: "Names are collected from media reports across the state, and by reporters at The Birmingham News and The Huntsville Times. Names will be continually added to this list as they are released by authorities and family members. Important note about death totals: Some counties have more names listed than deaths reported. This can be attributed to family members confirming deaths to local media, as opposed to coroners, or because the state EMA is not entirely certain the death was the result of a tornado. For example, in Madison County, one of the victims may have had a heart attack the same evening as the storms." Tornado-Stricken Churches Worship Outdoors. Charisma Magazine has the story: "Congregations in Alabama, Mississippi, Tennessee and Georgia gathered in tents, borrowed space or in buildings with the sunlight streaming through the damaged—or nonexistent—roofs. 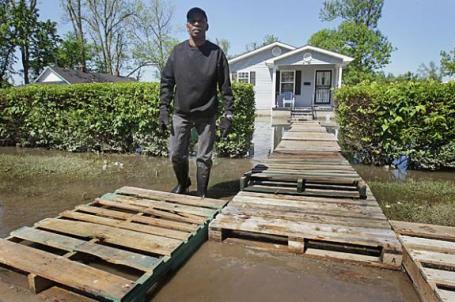 Last week's storm, which has claimed 340-plus lives so far, was the most devastating natural disaster since Hurricane Katrina destroyed New Orleans in 2005. 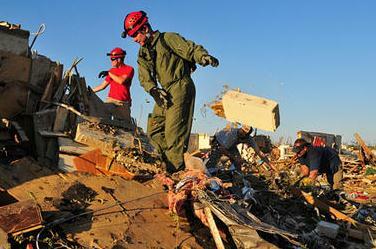 In the town of Phil Campbell, Ala., a tornado killed 20 people and destroyed 40 percent of the homes. At the Phil Campbell Church of God, congregants gathered on a bare concrete slab. Pastor Chris Burns—who lost his own home in the tornado—delivered his sermon behind the remains of the altar and in front of a cross with a hand-lettered sign reading, "He makes all things new." Christian relief organizations such as Southern Baptist Disaster Relief,The Salvation Army and Samaritan's Purse have moved quickly to respond to the storms' devastation with resources and helping hands." 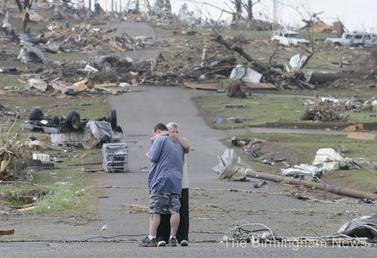 Tornado Leaves Couple With Nothing, But Not For Long. An uplifting story from the New York Times: "HENAGAR, Ala. — There’s the kindness of strangers, and then there’s what is happening to Regina and Jerry Wayne Walker. They used to rent a mobile home for $150 a month on a dirt road in this slice of rural northeastern Alabama. Then, last Wednesday, winds from a tornado so strong it killed 33 people in the county pushed their mobile home across the road like it was a toy. They woke up under a pile of rubble. Their cars were smashed. Her blouse had been blown off, landing in a nearby tree, cellphone still in its pocket. They were broke, bruised and stuck in a part of the country so remote that the Red Cross did not show up for three days. They thought about going to a shelter or perhaps a relative’s house, but they were scared to leave for fear that what little they had left might be taken by thieves. But what to do? 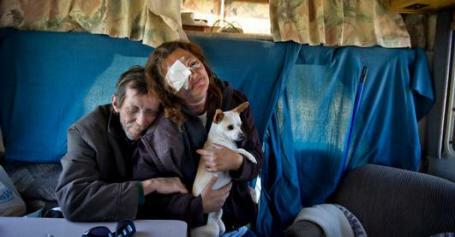 They had nowhere to live.Someone, no one knows who exactly, brought a tent. People showed up with water and food." "Hail-Sticks Falling From The Sky?" 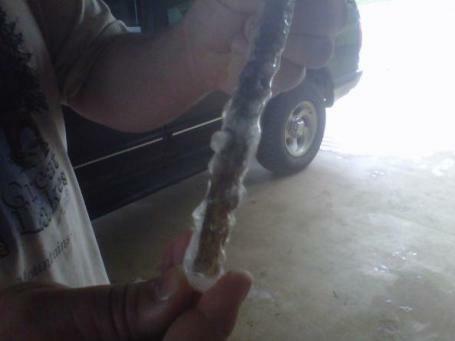 James Spann's Alabama Weather Blog has an interesting post about an ice-covered stick that fell from the sky during last week's unprecedented tornado outbreak. With all the debris being suspended aloft it's not unreasonable to assume that ice could have coated these objects before gravity pulled them down to the ground. More details: "An explanation? Hailstones form due to the turbulent nature of thunderstorm updrafts and downdrafts. All hailstones form because of some kind of nucleus that gets covered in ice in the sub-freezing part of a thunderstorm. That nucleus gets tossed up and down between the coldest and warmest parts of the cumulonimbus cloud. When it falls into the warmer segment, it gets covered in water, then it blows back up to the top to freeze again. Every time this cycle happens, the hail stone grows." Pop-Cultured: How I Stopped Hating James Spann And Learned To Love Weather Broadcasts. James Spann is the veteran Birmingham TV meteorologist who provided continuous coverage on ABC 33/40 last week. At one point more people were probably watching (via the Internet and UStream) than over the air and cable - he saved a lot of lives with his blow-by-blow reporting of Doppler, raw video and live Internet streams. I've never seen anyone do it better. Here's an editorial from a (new) viewer who seems to have newfound respect for TV meteorology and Mr. Spann - at least one guy who won't complain the next time Oprah is interrupted by a tornado warning. Excerpt courtesy of the Anniston Star: "I’ve always hated weather broadcasts. Specifically when they interrupt a program I’m watching to let me know about some weak thunderstorm three counties away that isn’t a threat to anyone. And of course the weather is coated with that thick glaze of fearmongering that paints the coverage of every piece of TV news. And then there is my biggest pet peeve, coming home to watch a DVR’d 30 Rock after a long day at work and getting 30 minutes of James Spann. I’ve always wanted a single channel that people could go to for dedicated weather coverage that won’t interrupt a show that I’m watching — you know, like The Weather Channel. I have relatives who could watch weather programming for days. Not me. But after April 27, you can count me among those who can at least tolerate when a meteorologist interrupts whatever show I’m watching...."
Flooding Forces More Evacuations Along Mississippi, Ohio Rivers. I've seen some rainfall amounts 6 times higher than average, as of May 6. As much as 20"+ has fallen across portions of Missouri and Arkansas, run-off from heavy rains and a stalled front combining with snow melt that took weeks to reach the main tributary of the Mississippi. CNN has an update: "Authorities in the Memphis, Tennessee, area fanned out Friday to warn residents of rising river levels, and the U.S. Coast Guard planned to close a stretch of the Mississippi River to all traffic as a flood of historic proportions expanded its reach. Authorities in Shelby County, Tennessee, which includes Memphis, began visiting neighborhoods to urge residents of low-lying areas to evacuate, said Memphis Mayor A.C. Wharton. 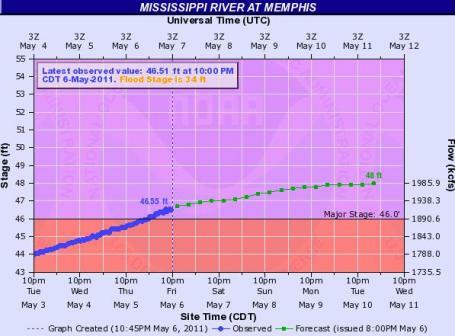 The Mississippi River is expected to crest about 14 feet above flood stage there Wednesday. "We're trying to prevent as many rescue missions as we can and manage this through evacuation missions," said Bob Nations, director of the county Office of Preparedness. Nations said authorities are planning as if the river will exceed the forecast crest. This is an act of nature, and nature plays funny tricks sometimes," he said. The Coast Guard's decision to close a five-mile stretch of the the Mississippi River at Caruthersville, Missouri, was taken to prevent wave damage to flood-control structures in the area, according to Chief Warrant Officer Lionel Bryant. The river was previously under a safety zone rule allowing only one vessel through the stretch at at time, he said." 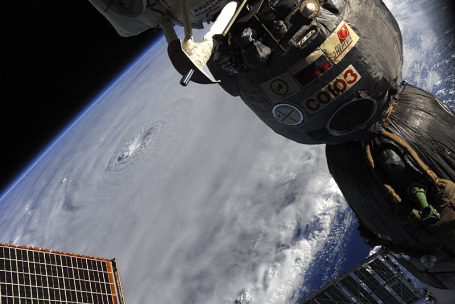 Proactively Preparing For Hurricane Season And Other Emergencies. The Stamford Patch has the details: "The hurricane season officially starts June 1 — are you prepared? For that matter, are you prepared for a tornado, earthquake, severe weather of any sort, or heaven forbid, a Weapon of Mass destruction incident? The country, as a whole, has experienced some very unusual weather lately, resulting in wide scale destruction and some fatalities. Maybe you think that those calamities cannot happen in Fairfield County — only in the South and West — but a year ago last March, many of us were without power for days, property was damaged or affected by downed trees, schools were closed and our public services were limited. The Bridgeport area was hit with a tornado last year, but we have been relatively lucky, so, "It can't happen here," you might say. But what is to prevent the repeat of a hurricane such as the "Hurricane of 1938" that killed about 600 people in New York and New England? I live through that hurricane as a child and a large tree hit our house." Spring Showers. Storms, given a choice, PREFER to come on weekends, when the most people can enjoy them. Actually, there's no statistical evidence that rain is any more likely on a Saturday than, say, a Tuesday. It's just that more of us are outside, at the mercy of the elements, more AWARE of the weather hovering above our heads, more "weather sensitive." I don't expect an all-day rain, but a few hours of showers (and T-storms) are possible today - conditions aloft not ripe for anything severe, but the NAM model prints out about .20 to .40" for much of the metro, with a few 1-1.5" amounts just south/west of the metro, closer to Glencoe, Willmar and Morris. Have a "Plan B" for part of today, again late Sunday afternoon. Today: Mostly-Dry. The sun should be out part of today, enough for upper 60s by late afternoon. A trough of low pressure (wrinkle of chilly air aloft) may spark a few spotty showers by midday or afternoon - but no steady, all-day rains are expected, just an hour or two of showers for most towns & neighborhoods. This will be convective, "hit-or-miss" shower activity, affecting some areas, while other towns escape with little or no rain altogether. Waterproof Mom. No, Sunday won't bring a non-stop torrent from the heavens, but once again there may be a couple hours of showers, even a clap of thunder - best chance afternoon and evening hours. Conditions are NOT ripe for anything severe through the weekend. Tuesday: 70s & Thunder? All the models track a storm into southwestern Minnesota by Tuesday, an accomanying warm front pulling 70-degree warmth into southern Minnesota by Monday and Tuesday, possibly lingering into Wednesday. 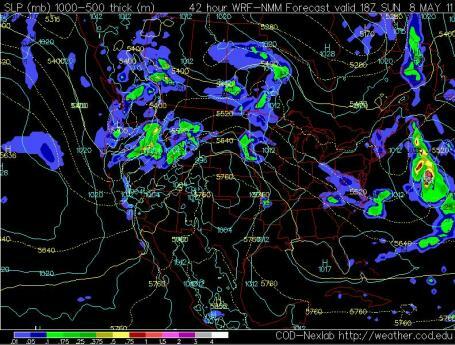 Along that warm frontal boundary scattered showers and T-storms will pop, especially nighttime hours. Although winds aloft won't be particularly strong, there may be enough marginal instability for a few strong/severe storms the first half of next week. 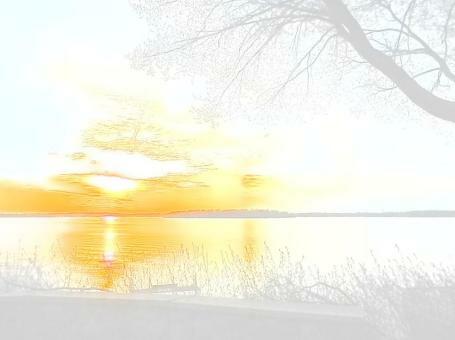 Chilly Walleye Fishing Opener? The latest models forecast a "closed low" over the Great Lakes next weekend, meaning showery rains from Wisconsin to Michigan, and a possibility of "wrap-around" clouds over much of Minnesota. More important - a gusty north wind will probably be blowing, daytime highs may be stuck in the 40s and low 50s north, near 60 over southern Minnesota by late afternoon. Fishing Opener (May 14): Partly to mostly cloudy, windy and cool, a passing sprinkle can't be ruled out. Sunrise Temps: 35-40 F. northern lakes, 38-44 central lakes, 41-45 metro lakes. Afternoon Highs: 48-53 northern lakes, 54-59 central lakes, 58-63 metro lakes. Yep, That's What I'm Looking Forward To A Week From Today. The truth: I stand a better chance of becoming a famous Russian ballerina than catching a fish that big. Cold Snowy Start To May. 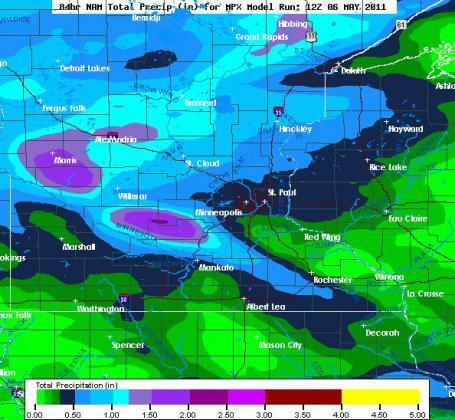 Dr. Mark Seeley at the University of Minnesota has some good information (as always) in his weekly WeatherTalk blog: "Several observers reported a very cold start to May. May 1st was the coldest in history for some. The National Weather Service put out a notice that Grand Forks tied their record for coldest daytime temperature on May 1st with a reading of only 34 degrees F. Similarly, Fosston, Thief River Falls, and Wadena reported record maximum values of just 30 degrees F, while McIntosh, MN reported a high of only 26 degrees F. St Cloud reported a record cold maximum temperature value on May 1st of 39 degrees F, while Eau Claire reported a record cold maximum temperature on May 2nd of just 39 degrees F as well. Embarrass reported overnight lows of just 18 degrees F on both May 3rd and May 4th. All of these readings rival those of the previous coldest start to May back in 1909. 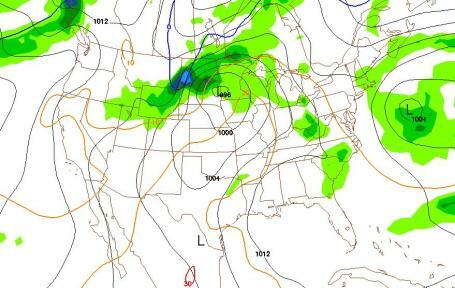 Many observers also reported snowfall on the first two days of May, albeit just a trace. Nevertheless some communities received measurable amounts. Warren ( Marshall County) reported 1.3 inches, International Falls 0.4 inches, Twin Valley 0.6 inches, Moorhead 0.7 inches, Brainerd 0.2 inches, and Itasca State Park 0.2 inches. 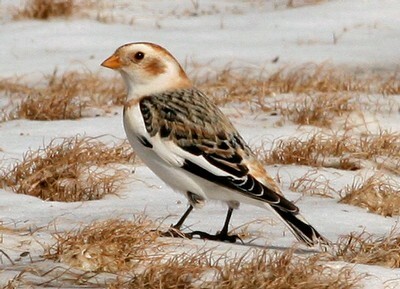 Perhaps these are the last snowfall reports of the spring." * I sure hope so - not sure I can take another snowfall. 86.6" is quite enough for one winter season, thank you very much. Navigating With Social Media. 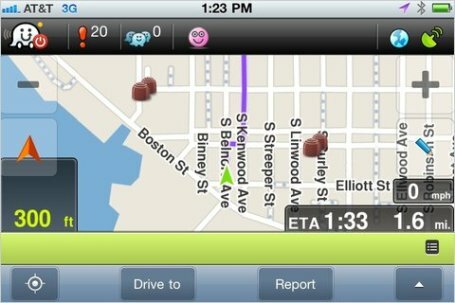 The New York Times has some good ideas about new apps that can keep (guys) from having to ask for directions. Thank God: "WHEN Mark Rosch and his wife, Carole Levitt, were traveling to Kansas City, Mo., on a recent trip for their legal education and research business, they did not want to miss an opportunity to dine across the state line at Oklahoma Joe’s Barbecue in Kansas City, Kan. But after arriving by taxi at the award-winning restaurant, located in a former gas station in a residential area, they worried about finding a taxi to take them back to their hotel after dinner. Then, Mr. Rosch, 46, remembered that he had recently downloaded to his phone a new travel app, Taxi Magic, a free nationwide online taxi booking service. He had never used it. He had no idea whether Kansas City was included in the database. “So it was the perfect experiment,” he said. “I put in the information of the intersection where we were located and submitted my request. I got a message back on my phone with the cab’s number and approximate time of arrival. It worked.” Traveling about 140 days a year from their home near Albuquerque to law firms around the country, Mr. Rosch and Ms. Levitt, who run Internet for Lawyers, have found themselves experimenting with and increasingly relying on the growing number of mobile apps and new social media tools. With so many tips and recommendations, they can navigate more easily through airline terminals and strange cities and find good deals along the way." Michael Moore To CNN's Piers Morgan On Bin Laden: "We've Lost Something Of Our Soul." Left-wing ideologue Michael Moore is at it again, whipping up controversey over the morality of celebrating Bin Laden's death. It's hard to find too many people living in the "west" who are mourning Bin Laden's death - but what (if any) are the ethical considerations of what went down? Did Bin Laden have any moral misgivings about ordering the actions that resulted in 3,000+ deaths on 9/11? Don't think so. But by rejoicing over the death (of anyone) are we lowering ourselves to Al Qaeda's level? I don't pretend to have the answers, but (a few) people, like Moore, are raising these ethical questions. Huffington Post has a recap here: "Michael Moore doubled down on his criticism of the killing of Osama bin Laden, telling CNN's Piers Morgan on Thursday that, while he is glad bin Laden is gone, America "lost something of [its] soul" in killing him without putting him on trial. Moore first gained attention for calling the killing an "execution" in an interview on Wednesday, and he repeated that charge to Morgan. He also criticized people who went to Ground Zero to celebrate bin Laden's death. "I hear a lot of people often say, what would Jesus do?" he said. "I don't think Jesus would go down to Ground Zero like a lot of people did...and have a party." Morgan asked him why he took issue with the way bin Laden died. Moore said that the killing deviated from the notion that everyone has a right to a trial: "We've lost something of our soul here in this country...something that separates us from other parts, other countries where we say everybody has their day in court no matter how bad of a person, no matter what piece of scum they are, they have a right to a trial...after World War II, we just didn't go in and put a bullet to the head of all the top Nazis. We put them on trial." 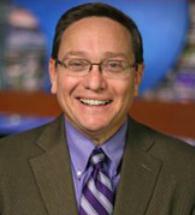 KERO-TV Fires Chief Meteorologist After He Objected To Reacy Strip-Club Story. So much for the notion of free speech in Bakersfield, California, according to this story at mediabistro.com. : "KERO‘s chief meteorologist Jack Church is no longer with the station and the veteran weathercaster says that he was fired after he objected to the ABC-affiliate’s airing of a story on local strip clubs. Church, who appeared on KERO’s 5, 6, and 11 p.m. newscasts, posted the following message on his Facebook wall on Thursday: "Lost my job w/KERO-TV. We were set to air story @ start of sweeps in 5pm news featuring strip clubs & how they’re doing well in down economy. I protested saying it was inappropriate material for local newscast. Based on my Chrisitan values I could not be to part of this newscast. I asked to have day off when it would air. They denied request, I did’nt appear they fired me 5 days later for breach of contract." The story that Church objected to is presumably this one, which details how area strip clubs are still doing well in spite of the economic downturn. KERO management was not immediately available for comment." A Perfect May Day. Not sure it could be any better than yesterday. Under a blue sky (much of the day) the mercury reached 63 at Duluth, 68 in St. 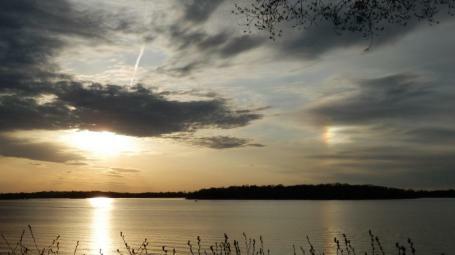 Cloud and 70 in the Twin Cities, 4 degrees above average. Last week's record-smashing tornado outbreak (312 tornadoes in a little over 48 hours) should serve as a gentle reminder that all the technology and media in the world will never substitute for common sense and personal responsibility. Sorry to preach, but many of the 359+ deaths last week were ultimately preventable, had people heeded the warnings and reached a basement in time. "Paul, I'm OK. I live in a city, by a lake or river, next to a hill. Tornadoes can't hit me here, right?" Think again. These fickle and rare super-updrafts can form anywhere, anytime, even over metropolitan areas. May 6, 1965 saw a swarm of tornadoes, at least four EF-4 twisters, two of them leveled much of Fridley. Waconia, the Lake Minnetonka area and Moundsview were hit hard: 13 deaths, at least 371 injuries. It's been fairly quiet ever sense; I worry about a false sense of complacency. Yes, it CAN happen here. We need to be ready. A surge of warm, moist air (80 by Tuesday?) may create a ripe environment for isolated severe storms early next week. A few spotty showers sprout today and Mother's Day (don't forget) but the sun should be out much of Saturday and Sunday, highs well up into the 60s, close to average for this date. What a concept. Average. Much of the weekend should be dry; highs in the 60s. Time to make up for lost time in the spring-enjoyment department. 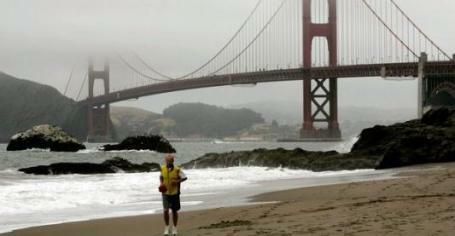 Bay Water Levels Expected To Rise. Climate models historically have a hard time predicting the rate of melting in Greenland and Antarctica - trends which may have a profound, long-term impact on sea levels worldwide. The New York Times reports on what this could mean for the San Francisco Bay Area "The nation’s oldest tide gauge, housed in a wooden shack on a pier at Fort Point in San Francisco, recorded something unusual over the past 30 years. While water levels in San Francisco Bay rise and fall every day with the tides, analysis of the gauge’s data shows that average water levels have fallen since 1980. Sea levels in other parts of the world, meanwhile, have been rising by an average of 2 to 3 millimeters per year due to the effects of climate change. The data from the bay are similar to those along the entire West Coast of the United States, which has been protected from sea level rise in recent decades by cold local waters and the effects of ocean currents. But oceanographers and bay planners fear that sea levels will surge along the West Coast in the coming years because Pacific Ocean conditions appear to be entering a new phase in a long-term cycle. Developed low-lying shorelines, like the Embarcadero in San Francisco, are vulnerable, they say, with a possible rise of 14 inches in sea level by 2050." How Much - How Fast? Using highly-calibrated, extremely sensitive satellite "altimeter" observations, oceanographers have been plotting sea level rises since 1993. More details from the Sea Level Research Group at the University of Colorado: "Since 1993, measurements from the TOPEX and Jason series of satellite radar altimeters have allowed estimates of global mean sea level. These measurements are continuously calibrated against a network of tide gauges. 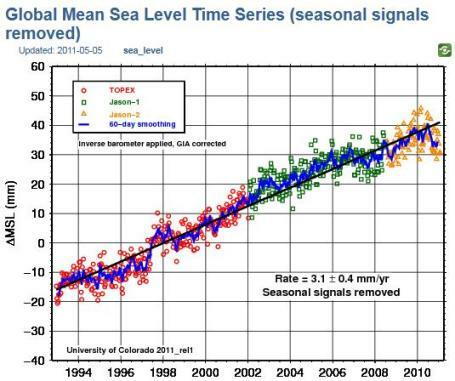 When seasonal and other variations are subtracted, they allow estimation of the global mean sea level rate. As new data, models and corrections become available, we continuously revise these estimates (about every two months) to improve their quality." "Green Smoke" Is Sighted As Vatican Releases Glacier Report. The New York Times has details: "Climate change is shrinking the world's mountain glaciers, whose retreat creates new risks for humans and sensitive ecosystems alike, warns a new report commissioned by the Roman Catholic Church. "The widespread loss of ice and snow in the world's mountain glaciers is some of the clearest evidence we have for global changes in the climate system," concludes the analysis, which will be delivered to Pope Benedict XVI. It was assembled by an international team of experts at the behest of the Pontifical Academy of Sciences, the Vatican's non-denominational scientific arm. The report warns of "serious and potentially irreversible impacts of global warming caused by the anthropogenic emissions of greenhouse gases, and by changes in forests, wetlands, grasslands, and other land uses," urging steep cuts in the world's output of heat-trapping pollutants. Failure to do so will imperil vulnerable ecosystems and human societies that depend on glaciers for freshwater, it says, including a huge swath of Central Asia where mountain glaciers store water for millions of people. Inaction also leaves some communities vulnerable to flooding from unstable meltwater lakes that can burst without warning, causing outburst floods and mudslides." 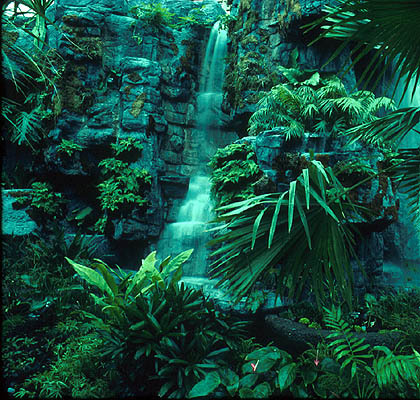 Forests May Spur Financial Rewards, Curb Climate Change, UN Says. The story from Bloomberg News: "The world’s forests may spur financial rewards and risk management opportunities as a way to curb climate change, according to the United Nations. Tropical forests are disappearing at a rate of about 13 million hectares (32 million acres) each year, or an area the size of Greece, which is equivalent to the release of six billion metric tons of carbon dioxide into the air, according to a UN Environment Program report published today. That’s about 3.6 times the emissions of power stations and factories under the European Union cap-and-trade program last year. Financing tree projects that create carbon credits can be profitable, reduce risk portfolio diversification, and cheapen compliance costs for emitters, the UNEP said in the report entitled “Reddy Set Grow,” in a reference to Reducing Emissions from Deforestation and Degradation, or REDD. The document outlines the role of banks, insurers and investors in forestry carbon markets. Trees absorb carbon dioxide for growth and release it when they rot or burn. BNP Paribas SA and Wildlife Works Carbon LLC said Sept. 21 they plan to develop credits from REDD projects in Africa. 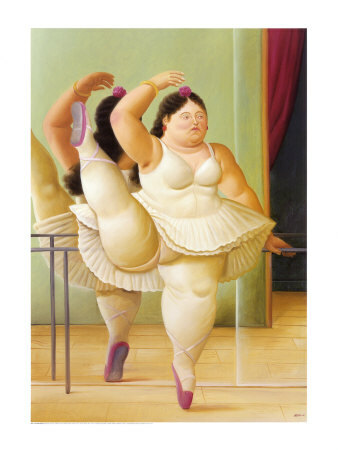 BNP Paribas committed as much as $50 million of finance for such activities." Global Warming Hinders Crop Yields, Study Finds. The story from the New York Times: "Global warming is already cutting substantially into potential crop yields in some countries — to such an extent that it may be a factor in the food price increases that have caused worldwide stress in recent years, researchers suggest in a new study. Wheat yields in recent years were down by more than 10 percent in Russia and by a few percentage points each in India, France and China compared with what they probably would have been without rising temperatures, according to the study. Corn yields were off a few percentage points in China, Brazil and France from what would have been expected, said the researchers, whose findings were published in Friday’s issue of the journal Science. 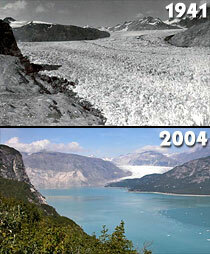 Some countries saw small gains from the temperature increases, however. And in all countries, the extra carbon dioxide that humans are pumping into the air acted as a fertilizer that encouraged plant growth, offsetting some of the losses from rising temperatures caused by that same greenhouse gas."